DreamWall fully realised modelling and textures for set environment and props. We also worked on animation (1 third of the movie). Project ran from July 2015 to January 2017 with a staff of 45 people. 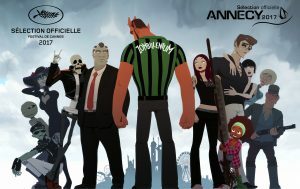 Zombillénium will be presented for the very first time inside the official Selection at coming “Festival de Cannes” on Wednesday the 24th of May, and then at “Festival d’Animation d’Annecy” for opening and competition too. Produced by Maybe Movies and Belvision in coproduction with Dupuis Audiovisuel, Gebeka Films, France 3 Cinéma, 2 minutes, Pipangaï, Gao Shan, Zombillénium will be presented in movie theaters the 18th of October 2017.